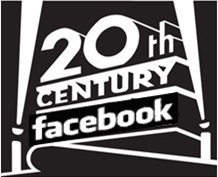 Is Facebook a content or conversation source? Back in May, Matt Locke, Richard Sambrook and I had a conversation about the future of Social Entertainment. (In case you are thinking “My that’s a wonderfully catchy, if opaque, buzz word. But what on GoogleEarth does it mean?”; Social Entertainment is a term we coined a few years back to represent the idea that as social networks grow to parallel the influence of mainstream media channels, so too would traditional media companies need to progress their content and communications to fully embrace the social sphere). Not rocket science, perhaps, but we’re interested in the implications of Social Entertainment, especially with regard to how entertainment companies communicate with audiences. It’s highly probable that no one listened to the podcast back in May (I haven’t asked for the statistics lately, in case my worst fear was confirmed and we had chopped down trees, but no one was around to hear the loud thud of timber on the forest floor). So if you didn’t, let me summarise: We talked about some meeja things and at the end Matt and I made some predictions for the next 12 months. The erudite Mr Locke suggested that the talent rather than the media brand would continue to increase in influence and that this posed both a problem for the brand and an opportunity for talent looking to take advantage of the currency of their social profiles. The case of @ITVLauraK (nee @BBCLauraK) perfectly illustrates this issue. Both Tom Callow at TheWall and Jemima Kiss at the Guardian sum up the ramifications better than I could. Congratulations Matt. You were right. Back in May, I felt the interesting shift would be the inverse of our original Social Entertainment theory. I.e. Social Entertainment originally concentrated on how traditional entertainment companies could leverage social channels to engage audiences. I predicted (again, perhaps not radically) that Social brands would expand to become fully fledged media channels and businesses. This was based on increasingly professional content finding its way onto YouTube – but I thought that Facebook, Twitter and the like would increasingly become media channels – producing and distributing content, not just hosting conversations around it. Interestingly, our annual research shows a conflict in consumer perception, here. 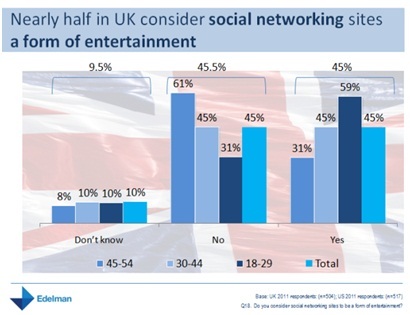 As this graph shows, consumers now think of social networks as a form of entertainment. 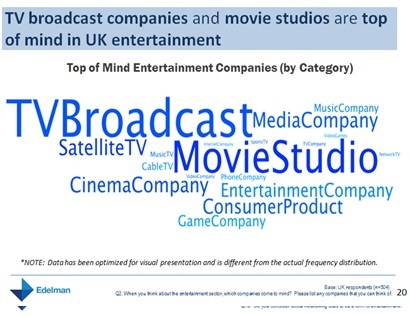 However, when asked who are the top-of-mind entertainment companies, consumers do not name new social or internet brands. No Facebook, no YouTube, no Spotify. Only the old dogs are named (I can’t actually show you the brands, but we do have this info should it be of interest. Let me know if so). And so here we are at the 22nd September 2011 and the f8 conference. Much has already been written about the social updates (I’d recommend the Mashable picture gallery, if you’re looking for a quick summary of what it’s all about). But I’m most interested to hear about how content companies and entertainment channels are going to be integrated in Facebook. Is this the coming of age for Social Entertainment? True my prediction, unlike Matt’s, has yet to come to full fruition. But with the f8 announcement, we may well be one step closer. The integration, assuming the often vitriolic users embrace it, will mean that Facebook becomes a powerful, if not the de facto, promotional channel for content owners and publishers. This presents an opportunity but also a challenge for entertainment brands. Content has always driven conversations. But some content is more naturally geared to social conversations and ‘lean forward’ programming than others. For all entertainment brands, programs and channels, not applying Social Entertainment is, from today, arguably not an option. It’s a simple dilemma; innovate and collaborate, or risk not being talked about at all. Edelman DERT’s fifth annual study looking at Value, Engagement and Trust in an era of Social Entertainment was presented this morning to a packed house at Edel Towers. Audio of the session is available over at Edelman Editions and video content will be online later today. For now you can download the presentation given by Gail Becker, President of Edelman’s West Coast Region from the SlideShare below. If anyone has comments or questions on the research or the four years that came before it, then please just let us know. There is a lot of debate about the role of formal education in PR so what skill sets are important for success in the business? PR professionals apparently have strong views on what it may or may not take to make it in the business. The discussion has over 100 comments where PR professionals advocate differing paths to success in the profession. With my own background as a magazine editor, I believe that a wide array of backgrounds and skills make the strongest PR teams. This means I don’t believe it is necessary to have a PR or communications educational background to make an impact in PR but I’d certainly like to have people on my team with formal training. It is important to gather a diverse range of skill sets to mirror the diversifying communications landscape without neglecting the bedrock of traditional PR. When I hired journalists, I preferred to hire young writers that had demonstrated that they were committed to the profession. Some had degrees in journalism but also had experience interning, volunteering and generally hanging around newspaper offices or publishing houses. It was more important to me that they were excited about being a journalist and had shown hustle in achieving that goal. A journalism degree was one proof point amongst several others. All of the over 100 comments included one or more proof points for success in the business so what does it take to be successful in PR? Formalized education, writing skills, business experience, media knowledge, social media savvy or just a keen interest and enthusiasm?